"The finest critical book on Virgina Woolf to date. 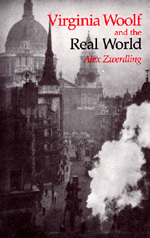 Alex Zwerdling's large and subtle study places Virginia Woolf's world of class, politics, feminism, pacifism, and the family into firm historical perspective. The book leaves us with renewed appreciation for Woolf's work and for her mind." "Buried beneath piles of criticism Virginia Woolf has at last been dug out by Alex Zwerdling. Virginia Woolf and the Real World is the most enlightened account of the real woman to appear for years." "A relief from the Bloomsbury fan dub: penetrating, learned, wide-ranging appreciation of Virginia Woolf in her social and political context, documenting what muscle and thought there was in her allegedly gossamer work." "A well written book that deals with a field of Woolf studies that badly needs dear thinking and dear expression .... I think it a most useful work and in every way first rate." Alex Zwerdling is University Professor of English at George Washington University.